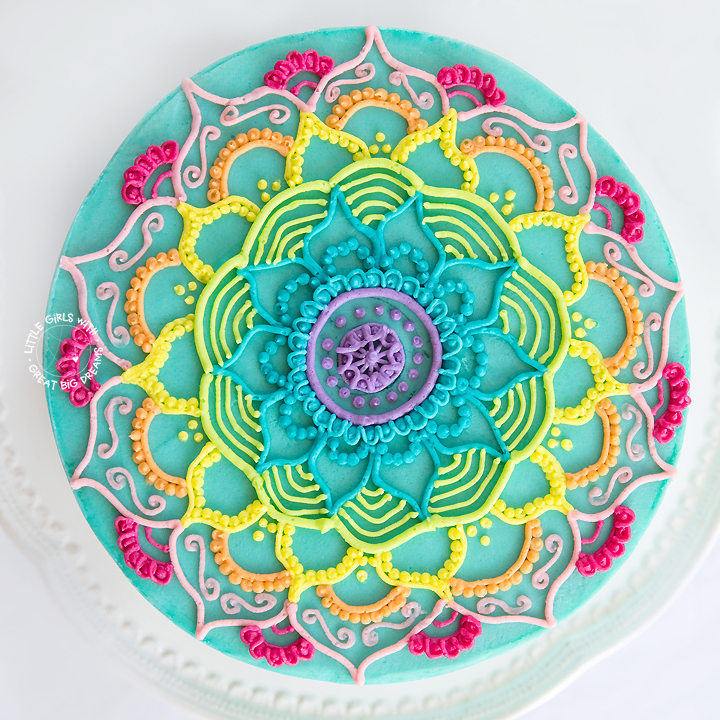 How to take amazing photos of cake! Once upon a time, people used to get so jealous that my “job” consisted of cuddling and taking photos of newborn babies… Nowadays, it seems I have attracted a few amazingly talented cake decorators into my life, and so those who follow along with me on social media are now jealous of cake and macarons! What can you do to get a better photo? Natural light – nothing beats it. It makes colours pop and whites true. Just remember you don’t need a lot of space – most people are surprised to see some of the crazy places I find with the best light (sometimes the best light in my house is in my bedroom so I set up on my bed!) I will share some behind the scenes pics one day soon! Don’t put anything behind a cake that competes for your attention. Make the cake the thing you can’t takes your eyes off. A plain white wall is a great choice, as is soft white brick, wood, or pastel shades. 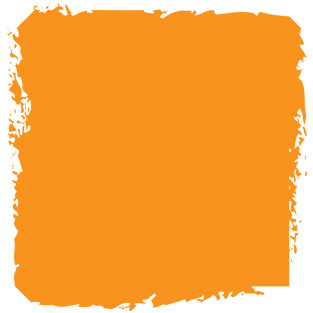 I generally tend to stick to white, or greys with my images – wood is lovely but it can often throw an orange tinge to the image so takes a bit more experimenting with to get the colours right. Think about whether you need landscape or portrait images. Where are you going to use the images? There’s no point taking a bunch of random photos, delivering the cake to your client, and then realising that you needed a close up of the piping, or that the rest of your photo album is filled with a particular perspective. It’s great to shake things up, but throw in a few normal front shots for good measure. Keep in mind that square images are best for Instagram and vertical images work best for Pinterest. For You Tube you will need a wide panoramic shot and if you want to add text details to the side of the image you will need to have enough space around your cake to do this. 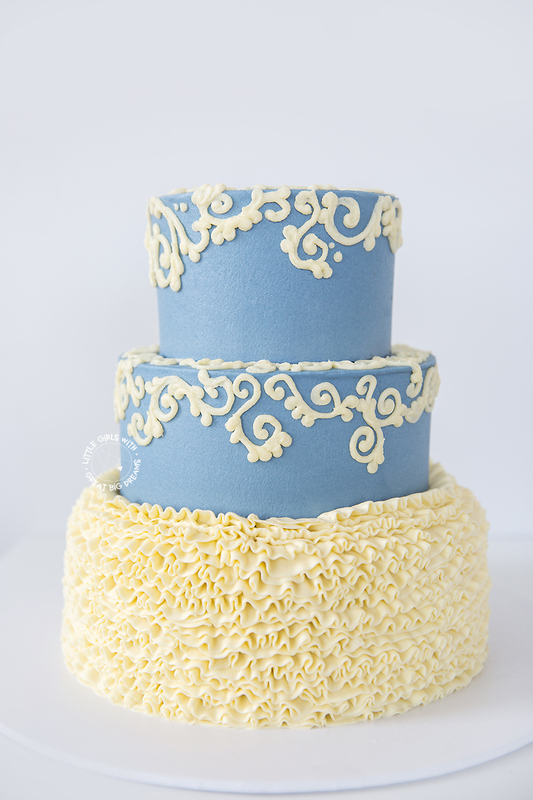 Composition wise, each cake will be different – some have all the detail on the top, so shoot from above. Some sections you may want to show off are on the side, so a nice simple front on shot will be best. Some cakes may be a bit special on the inside, and in that case consider making a test cake that you can cut and photograph to show off your masterpiece when it is ready to be eaten! Add props – flowers, macarons, sweets, a cup of coffee next to your cupcakes, even a hand reaching up to hold smaller cakes and cupcakes. These are all great ways you can add some drama or dynamic movement to your images and give your viewers the opportunity to connect with the image by imagining themselves in that situation. Experiment, like I did in this shoot. 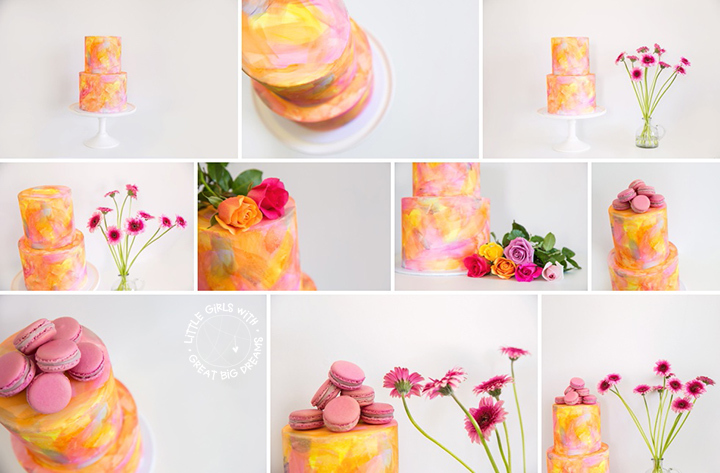 Vanessa from Cake Style who designed this gorgeous abstract painted cake bought two bunches of flowers, and some macarons from Fifi la Femme over, and I played around with all of them just to see what looked best. Which one is your favourite? 5. Make your creation shine! 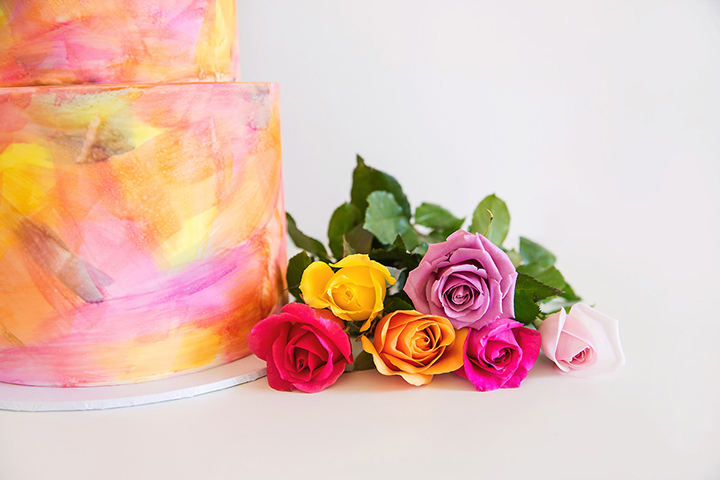 Make sure the feeling of the cake shines through – ultimately every cake you create tells a story, just like a painting, a portrait or any work of art. Look at the images, and really make sure you are capturing the essence of the cake. Does it make you feel playful, is it light and delicate, bold and striking? Make sure at the end of the day, the images you share evoke that feeling. When people look at these photos in your portfolio and resonate with them – they will contact you and book you to make a cake for them! That’s the end goal, right? 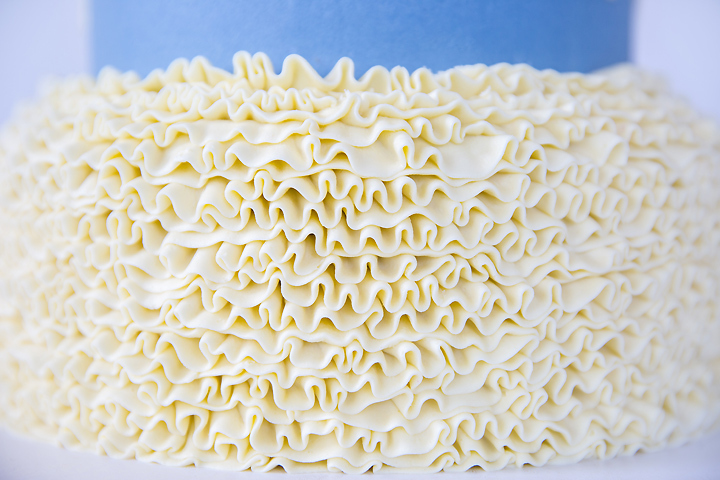 What issues do you have when photographing your cakes? What part of cake photography do you struggle with? I would love to hear any questions you have that I can potentially answer in my upcoming eBook or in a blog post. Please comment below, or send me a message. Be sure you join our newsletter mailing list below as I have a eBook coming out soon that is specifically about cake photography, and I’d love to keep you in the loop! If you live in the Newcastle area, or close enough to travel, you are welcome to contact me to discuss booking a photo shoot. All cakes in this blog post above made and decorated by Vanessa at Cake Style. « So much gorgeous cake!! !